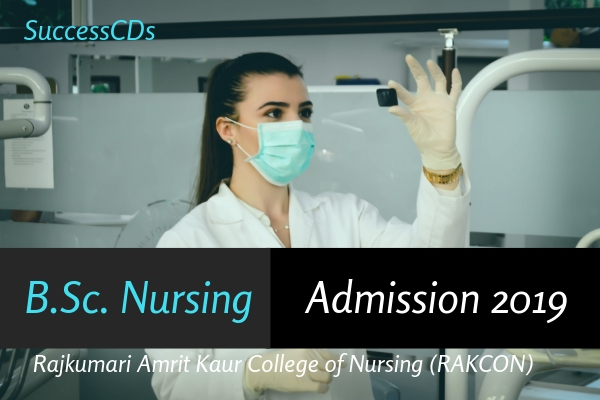 Rajkumari Amrit Kaur College BSc Nursing Admission 2019 - Rajkumari Amrit Kaur College of nursing, New Delhi has announced notification for admission to Bachelor of nursing course (4 years) commencing form 20th July,2019. Candidates seeking admission to first year B.Sc. (Hons.) Nursing Course must have passed the examination as listed below. Senior School Certificate Examination or Indian School Certificate Examination (12 Years Course) or an Examination recognized as equivalent thereto with 50% or more marks in the aggregate of 4 subjects including English Core/Elective, Physics, Chemistry and Biology provided the student has passed in each subjects separately. The selection of the candidates for admission to B.Sc. (Hons.) Nursing Course will be made on the merit of selection test. All candidates, irrespective of reserved or non-reserved category, have to appear for the selection test except foreign nations. Admission will be made on the basis of merit based on Selection Test to be held on 16th June 2019 (Sunday) at 10:00 A.M. at the venue mentioned in the Admission Ticket. Counselling will be done for candidates for final admission. Students should apply on the application forms issued by the College for the Session 2019-20 application Forms of Previous Years Will Not Be Entertained.